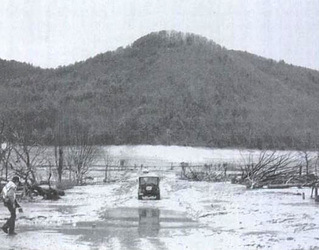 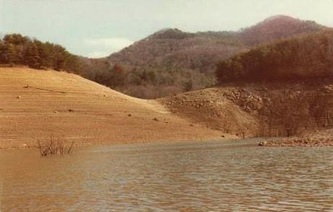 In 1983 a decision was made by the Tennessee Valley Authority (TVA) to lower the water level of the Watauga Lake down to little more than a river. 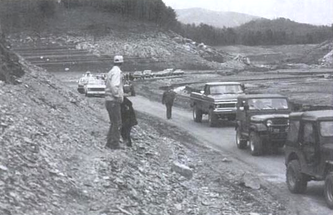 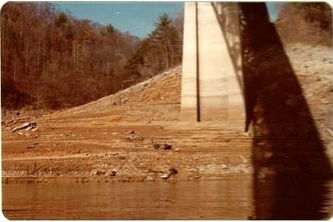 The draw down was necessary in order to make critical repairs to the Watauga Dam. It was important to drainthe lake in the winter months since this was when the lake would be at its lowest water level anyway and would give time to refill the lake before the 1984 boating season. Provisions were made at all boat docks and most boats were removed or dry docked. 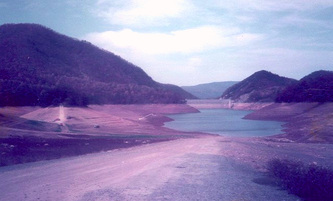 The drawdown began in late 1983. 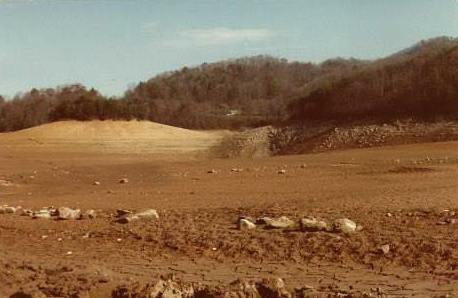 By the end of the year the lake was low enough to show the remains of the old Downtown Butler area. The remains of this small town had been submerged for more than 30 years however several of the locals had childhood memories of Old Butler. Many would return to the area to view the remains of what they used to call home. The visitors knew that this would be the last time they would ever visit the area that would be underwater again soon. There were mixed emotions as people viewed the rocks, crumbled foundations and dead trees. 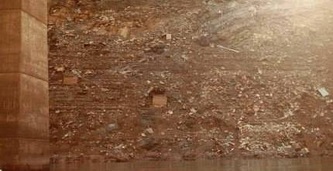 Some could determine the exact location of the homes they grew up in and could remember sitting on the front porch of the old home place where they would sit in the evening sun after a hard days work on the farm. Dave McDaniel and the Super-Cub on the lake bed. 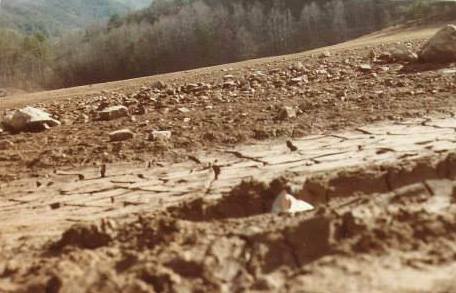 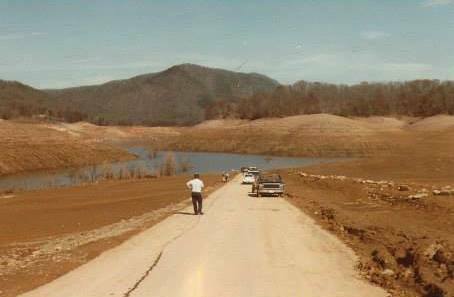 In early 1984 when the lake had been at its lowest level for a while, the ground that had been submerged for three decades began to dry out enough to allow folks to get off of the old road and actually walk on the lake bed itself. There were even a few instances when an aircraft landed on the lake bed. 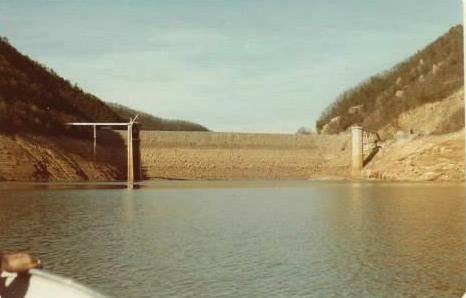 Here is a personal account of one instance as described by long time Carter County resident Dave McDaniel. 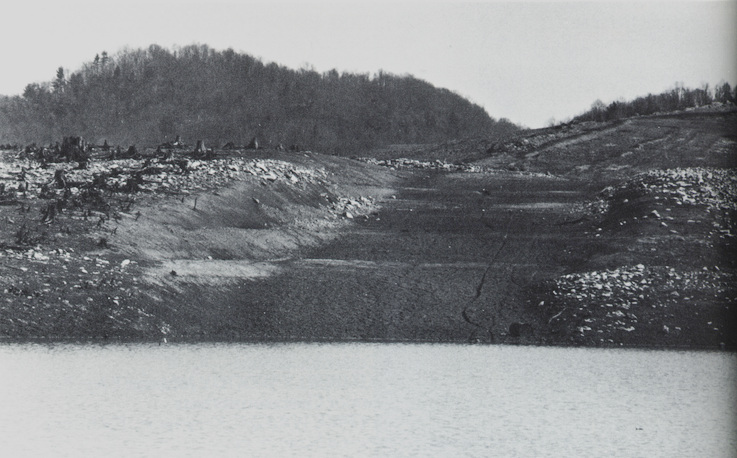 "When Watauga Lake was at its lowest point since filling, I had an opportunity to take a flight in a vintage Piper Super-Cub over Watauga Lake. It was an unbelievable sight for sure. 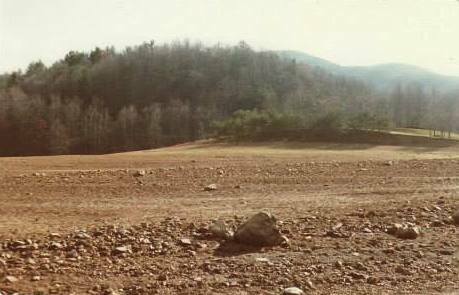 Little did I know this flight would include an "off-airport landing" on the dry lake bed at the uppermost end of Roans Creek, that included some tree stump avoidance upon landing and roll out." 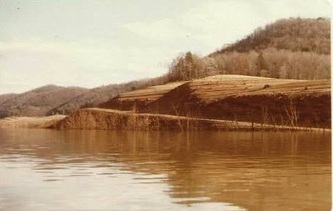 Members of the Carter County Rescue Squad would take their aluminum drag boats up to the lake and patrol the shorelines while the lake was at its low level. 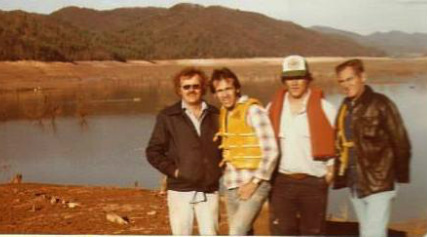 Pictured are Bud Sims, Jerry Arnold, Terry Arnold, and C. Y. Peters. The TVA would bring in a large barge that would have to be hauled to the lake in several sections. The barge which housed a crane was assembled in a nearby cove and then floated to the base of the dam where the repairs were made. 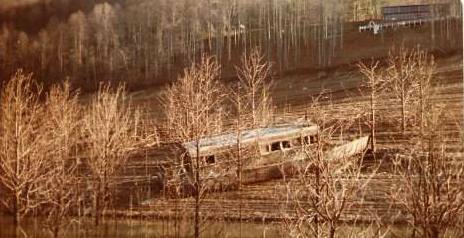 In 1984 the barge was moved to a nearby boat ramp, disassembled and the lake was filled back to summer levels. 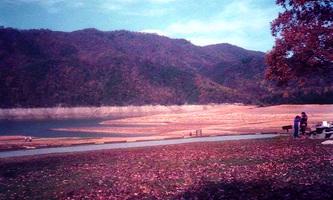 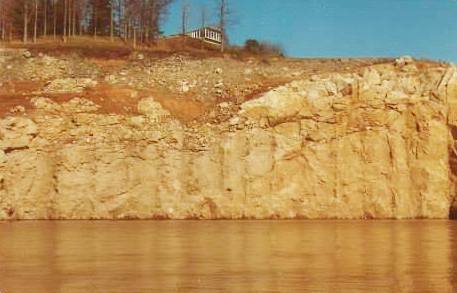 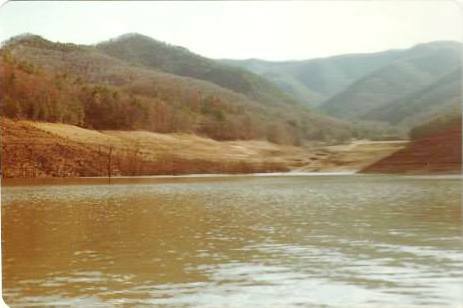 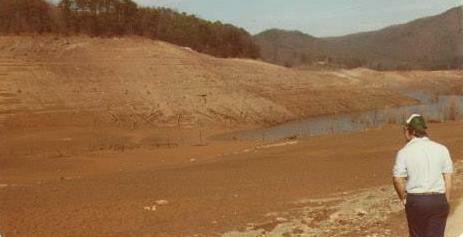 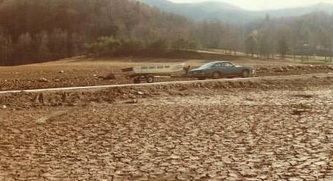 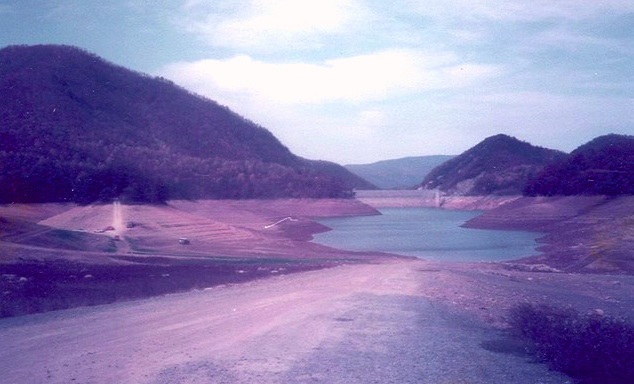 Below are several photos of the lake during the 1983-1984 low levels. 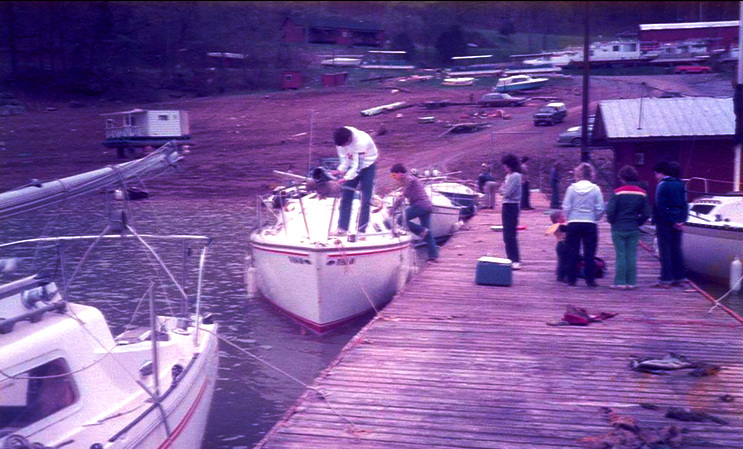 For best viewing, click on the first photo and use your left and right arrows to scroll through photos.